Charlie and Chris looking to put something down on a new Fountain! This past weekend Julie and I went up to Annapolis Maryland with a couple of my friends for the annual US Power Boat Show. We think we may want to become boat owners, but are still kicking the idea around, so this weekend was like a preliminary ‘test drive’ if you will, to get a feel for what’s out there and what we might be interested in if we should decide to buy a boat. 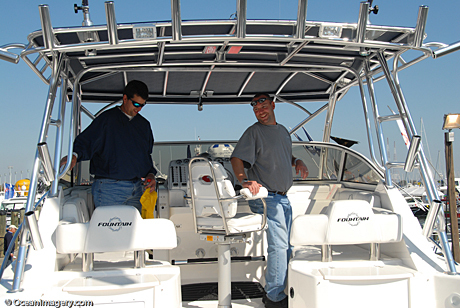 We are both big on researching our purchases and buying a boat can be like buying a second home, so it shouldn’t be taken lightly! Several of my friends are boat owners and the extra free information that you receive from a window shopping trip like this one to the ‘big kids’ store is absolutely priceless! It’s like going to a really nice restaurant… there are just way too many things on the menu and unless you have a favorite you have a hard time making a choice. And let me tell you, every sales guy thinks that the brand of boat he sells is the best boat in the world… NOT! 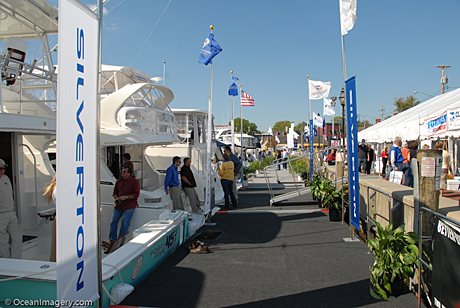 The US Power Boat Show – Annapolis, MDWell I guess all the ‘boat jumping’ paid off… No, we didn’t buy a boat! But we did get a good feel for what we like and I think we also narrowed the field of manufactures down to just two… Formula and Sea Ray. With all things considered (size, price, service, reputation, reliability, layout & design) and after picking them to death I think that the Sea Ray gives you the biggest ‘bang for the buck’ in the 30 foot and under boat category and it is also known for having a great re-sale value down the line…!! More research to follow… stay tuned! !